Keil's Clock Shop only maintains customer information for our records and does not share customer information with other parties. Keil's Clock Shop does not maintain your credit card number for future sales. All credit card transactions through our website are secured by Thawte. Thawte's SSL Certificate is used to offer secure communications by encrypting all data to and from the Keil's Clock Shop site. Authorize.Net is committed to providing its merchant customers with the highest level of transaction processing security, safeguarding customer information and combating fraud. We implement and maintain compliance with industry leading security initiatives such as the Payment Card Industry (PCI) Data Security Standard. More than 157,000 merchants trust Authorize.Net to process their Internet transactions securely. At Keil’s Clock Shop we want our customers to be happy with their purchases. We try to provide the best pictures and detailed descriptions to ensure our customers are making informed decisions. If You have any questions, please contact us by phone or e-mail and our expert staff will be happy to assist You before, during, and after your purchase. We provide our customers with a 30-day return policy and unrivaled support. 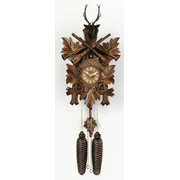 Shop with confidence knowing Keil’s will be there for all Your clock needs.